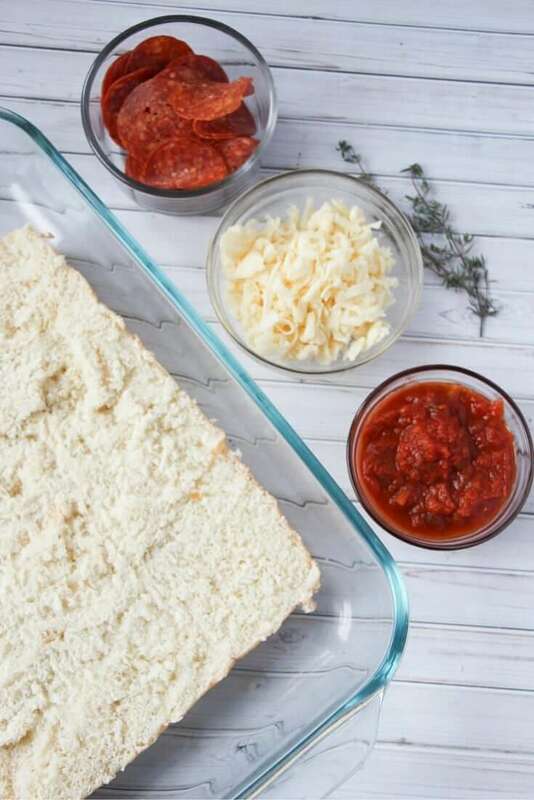 I first shared this cheesy, buttery pizza sandwich casserole on my friend Amanda’s site and have been itching to share it here with you! Sandwich casseroles are now my go-to contribution for any potluck event and I always go home with an empty casserole dish. Plus, you can really customize this one however you’d like with whatever your favorite pizza toppings are: lots of veggies, a variety of different meats, white sauces, etc. You could even go gluten-free or dairy-free (although, I’d rather use a cashew cheese than go completely dairy-free…) You could even do half of the sandwiches with one set of toppings, and a second set of toppings for the other half! 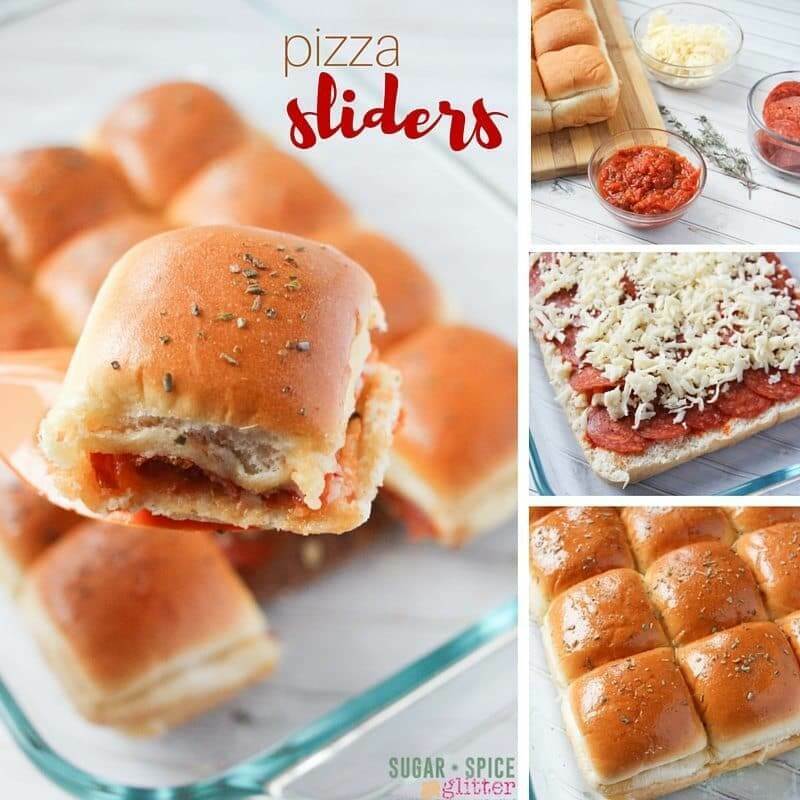 These pizza sliders are a fun twist on pizza night – and the perfect compromise between pizza or subs for dinner! They are also a great option for parties or tailgating, as they are delicious hot or cold (though I much prefer them hot). My daughter loves when I send along a couple in her lunch box the day after making them (and I don’t mind sneaking in one or two the next day either). 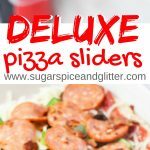 This recipe comes together in less than 5 minutes – here is a quick 1 minute video of me making some Deluxe Pizza Sliders. 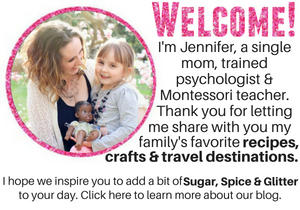 Check it out and then scroll down to grab the free printable recipe. 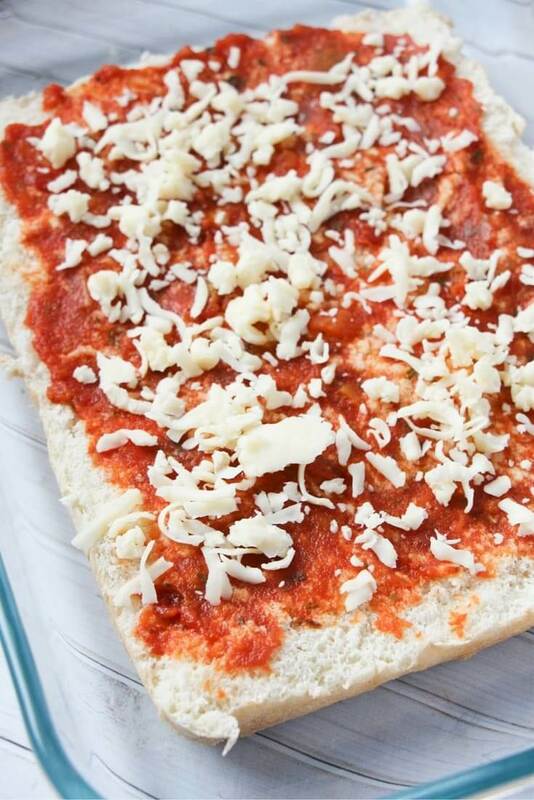 Tip: feel free to swap in or add your favorite pizza toppings in this recipe. It’s all about personal taste and enjoyment! 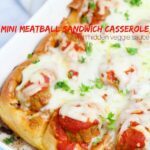 My kids loved helping with this recipe – I just cut the bread and let them help with layering on all of the pizza-style toppings! 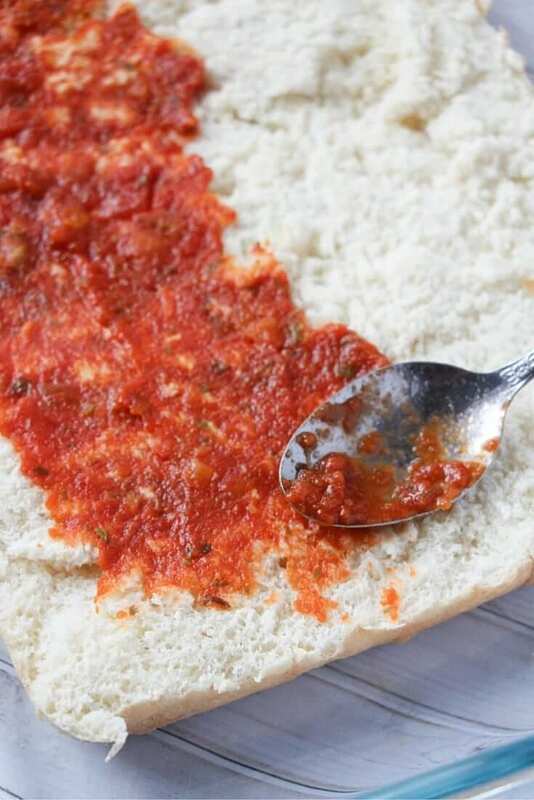 Apply a generous spread of pizza sauce to the bottom half of the bread. 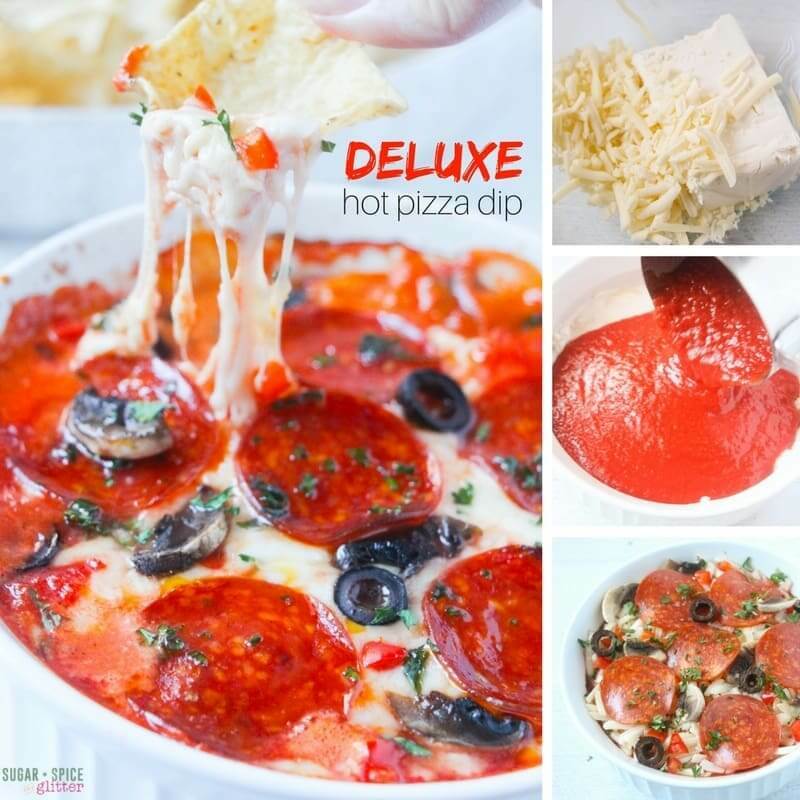 Top with a generous handful of cheese to encourage the pepperoni (or other toppings) to stay in place. 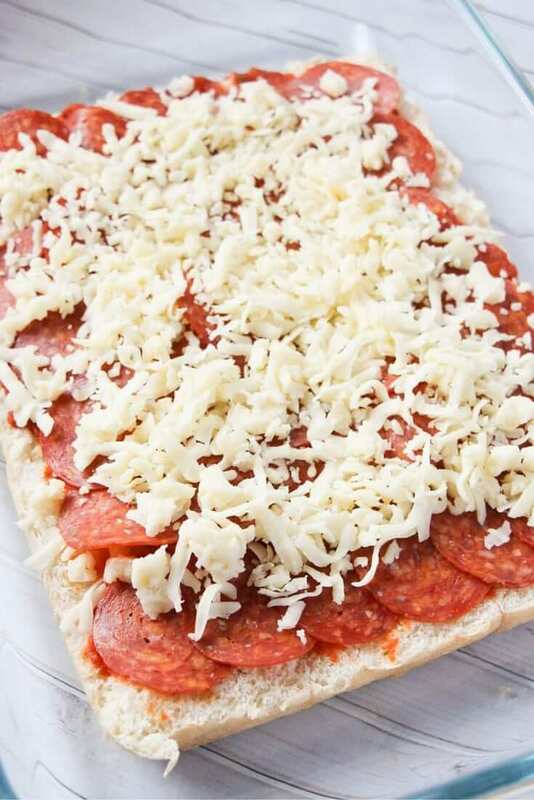 Cover with a layer of pepperoni – we used lots of pepperoni to ensure that every slice received some. 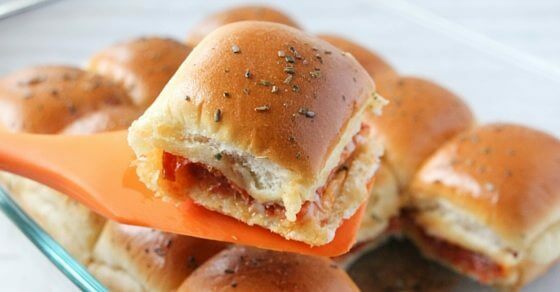 Place the remaining mozzarella cheese in an even layer over top of the pepperoni and top with the top of the sandwich rolls. Sprinkle the oregano overtop of the butter and then bake the pizza sliders for 20 minutes until the cheese is melted and butter has been fully absorbed, leaving golden sandwich tops. Slice the sheet of rolls across the middle, resulting in a top layer and bottom layer of 12 connected rolls. 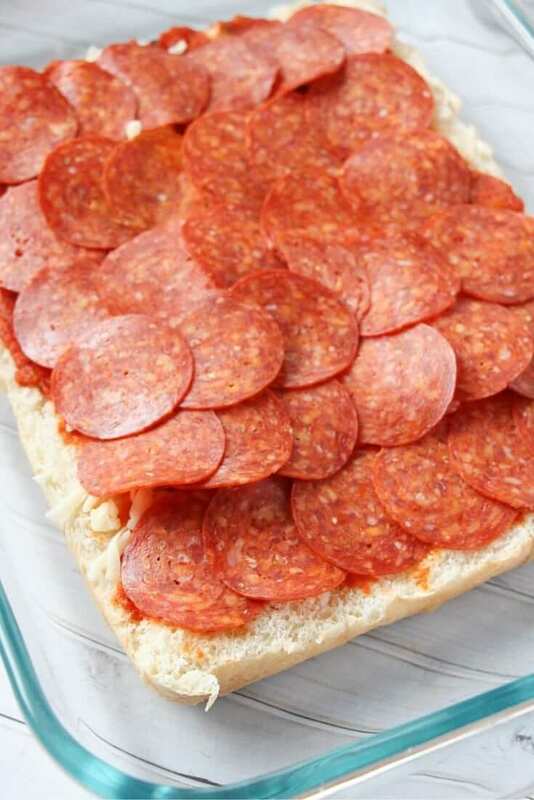 Cover with a layer of pepperoni. Melt the butter in the microwave, heating for 20 seconds and then stirring to dissolve any milk solids. 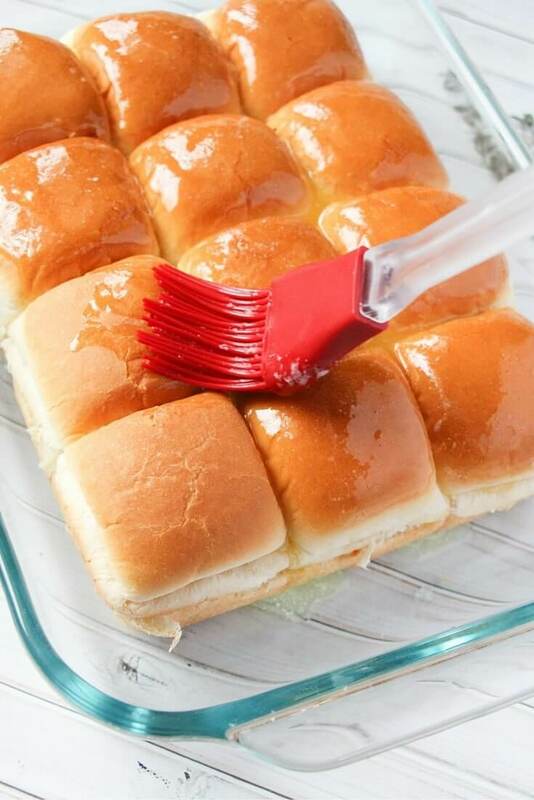 Pour or brush it on the top of the bread. 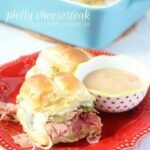 Have you tried homemade sliders or sandwich casseroles before? 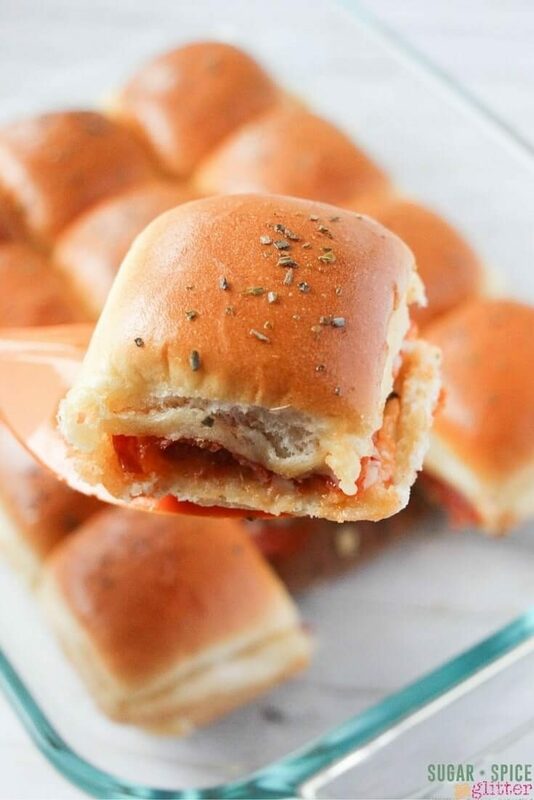 These buttery, cheesy pizza sliders are the perfect option for entertaining or for bringing along to a potluck. 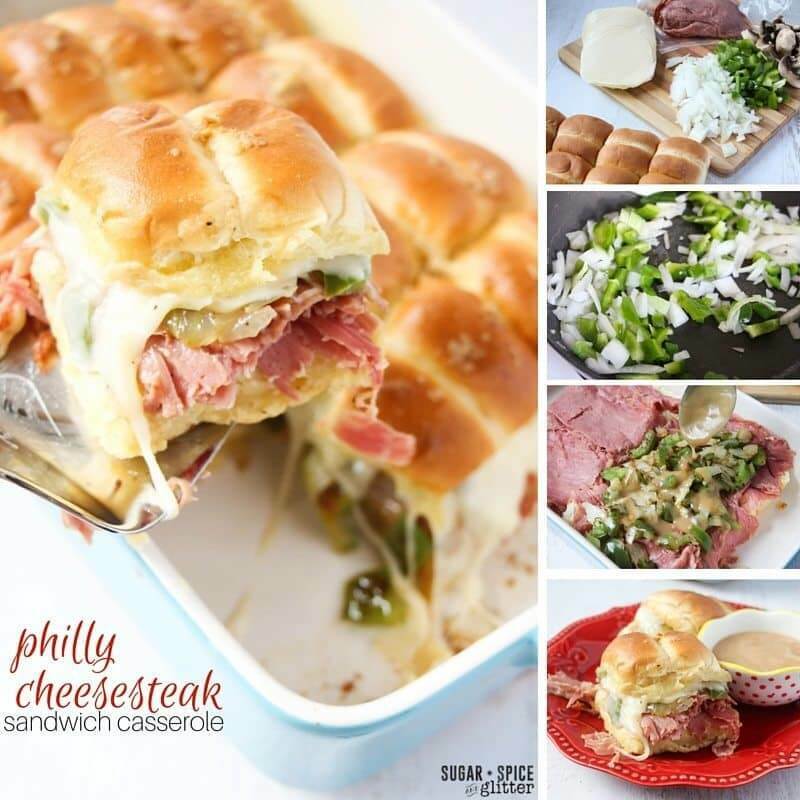 Be sure to check out our philly cheesesteak sandwich casserole, pizza burgers, hot deluxe pizza dip and maple-glazed pecan, apple & parmesan pizza! Sounds great! 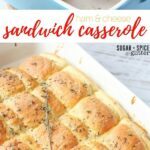 Definitely adding this to my rotation of go-to potluck dishes! Am I missing it, or does the recipe not give the temperature at which to cook these? Thank you. Same here! 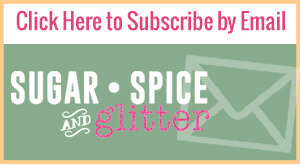 Sounds great, but I’m not seeing a temperature setting for the oven, either. These sound amazing! Just wondering, though: Do you think it would still work with green peppers or other vegetables instead of pepperoni? I think it’s all personal preference. With my daycare kids, I just served a side salad, but it’s great to just have the veggies in the rolls! That’s a surprisingly tricky question! I used 12 dinner buns so there’s 12 sliders, but I think if this is your main course you would want 2-3 for each person along with a side salad or something fresh and light. Sounds great! I am going to make them this week. Do you think we could keep the leftover sandwiches in the fridge and reheat in the microwave? I don’t want them to get soggy. They would soften like anything else would in the microwave versus reheating in the oven, but they won’t be soggy.